We deliberately left all of the best Christmassy things for our last day in New York. I was so excited for our day of Christmas fun and we started off the day super early. Warning, this post involves a whole lot of food! We started with a VERY long walk to Bloomingdales to check out their Christmas window. It was based on the movie The Greatest Showman and while it was impressive, I kind of hated it. There was nothing traditionally Christmas about it and if there’s one time of year when I’m all about traditions, it’s Christmas! Each window was interactive, from karaoke to seeing how high you could jump. Our next stop was Dylan’s Candy store where we intended to stop in the café for a milkshake of all shakes but it wasn’t open as we were there so early so we had a look around the shop and left. I have never seen so many types of candy before and so many take me back to my childhood. It’s worth the visit if you go. Next we headed to Central Park. We started off at the zoo although there weren't many animals to see. I love zoos and the sea lions were very entertaining! We also watched Rudolph the Red-Nosed Reindeer in 4D where I learnt that I'd been singing the wrong words my entire life. Who knew that Santa didn't in fact come to 'stay' but came to 'say'. We then spent some time wandering around, watching the ice-skaters and taking about a million photos. Central park is such a great place and that view of tranquillity surrounded by skyscrapers is incredible. We then walked along Fifth Avenue, stopping at Bergdorf & Goodman to check out their Christmas window. It was based on New York and was just insane. Bergdorf always have incredibly extravagant windows but this one was on a whole other level. We wandered along Fifth Avenue which was so insanely busy! We looked at the Christmas windows of all the very expensive shops. We finally ended up at the Rockefeller Centre. We were actually able to get near the sides of the rink and get some good photos which surprised me as last time we were here you couldn’t even get remotely close. Tired and cold, we headed into Jacques Torres for a hot chocolate. Known as ‘the chocolate man’ Google had informed me that this was the best hot chocolate in New York City. We bought a chocolate snowman too, obviously! The chocolate snowman was to die for but I wasn’t a fan of the hot chocolate. It was the most chocolaty hot chocolate I’ve ever had and I really wanted to like it, but I didn’t! 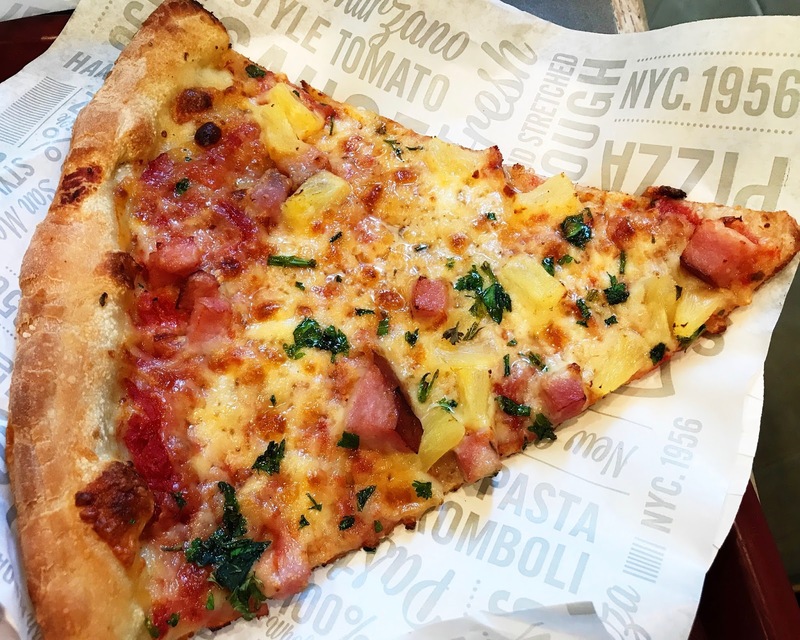 We then stopped for lunch, having a slice of S Barro’s pizza which I genuinely think it the best pizza ever although I’m sure New Yorkers would disagree with me. 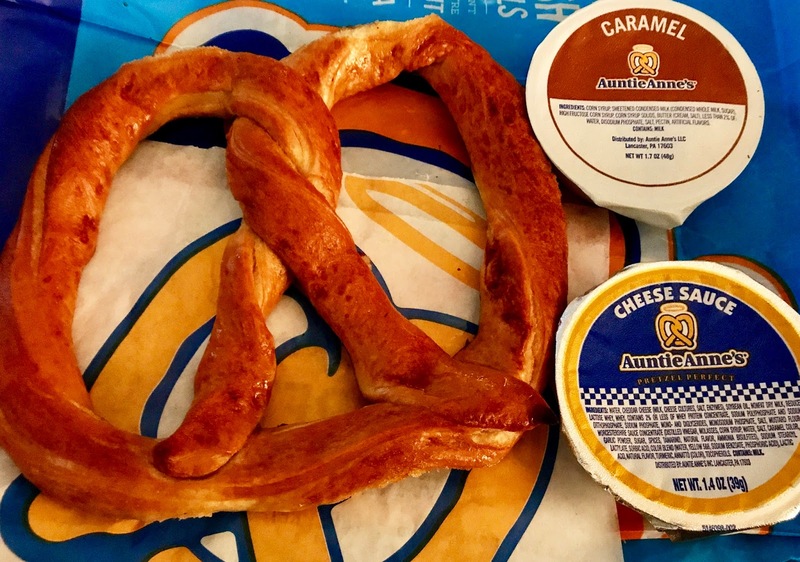 We also got a pretzel with dips. The caramel dip was incredible. By the time it got dark we were feeling pretty exhausted but wanted to see Saks Fifth Avenue and the Rockefeller Centre all lit up, so we did and I’m so glad we made the effort. Saks is just incredible and their light show is one of the best things I’ve ever seen. I mean only in NYC will you see a building with that many lights that dance to Christmas music. Their holiday window was fantastic too – it was Snow White. The last 2 times I have seen Saks window I haven’t seen impressed as it had been very modern. I loved that they had gone back to something much more traditional and it really was incredible – they outdid themselves! Our final stop was Ruby Tuesday’s where we had dinner. Since it was our last night I also ordered a large margarita which was amazing. The USA really knows how to make a damn good cocktail! By this point we were exhausted beyond description but so so happy! I can’t believe our times in NYC is over but I’m looking forward to heading home for the holidays. New York has been absolutely incredible and I’ve loved every single second. I can’t wait to come back! Did you visit NYC during the holidays? What did you get up to? So many amazing photos! We visited NYC a year ago and I loved it. I hope I can visit it again some day. In the whole world. Next time, I stress of ruby Tuesday turn serendipity! We sure did, it's one of my favourite places too! Christmas in New York looks absolutely magical, they really don't do things by halves do they? I love that the shop windows down Fifth Avenue are all so well decorated and was equally entranced by the Christmas lights and decorations too! Thanks Bianca, they really do do Christmas so well. I hope you get to visit in 2018! I'd love to go to NY around Christmas. Looks like there is a lot of glitter and bling bling...the chocolate looks rather Easterly, though. Anyway, it shows that you guys had a good time! I'd definitely recommend it, it's an experience you wouldn't forget. Yes, I was confused by the chocolate bunny! Thanks for dropping by! I'm so jealous!! It has been a long dream of mine to spend Christmas in the Big Apple. By the look of your photos, it definitely seems great to spend the holidays there. Keeping my fingers crossed for an NYC tour soon. Thanks Lyka, it was an incredible experience. I hope you get to experience it sometime soon! The decoration is just incredible and the chocolate snowman was yummy! Thanks for dropping by! Thanks Becca, we had such a great time. Wishing you a very happy, healthy and successful 2018 too!